article we are providing the SRPF Physical Tests information, SRPF physical events, Railway Constable physical tests information, city constable physical tests information, Mumbai railway police physical tests and other districts physical test details. Online applications are receiving completed on 03-03-2018 for Maharashtra Police Constable vacancies. Based on online applications district wise shortlist or merit list will be prepared for the documents verification and physical tests. Candidate must have provide original documents at the time of documents verification. 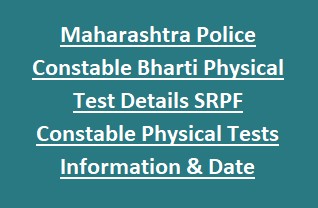 Maharashtra Police Constable Bharti Physical Test Details SRPF Constable Physical Tests Information event wise is given below. दि. १८/०३/२०१८ रोजी होणारी मैदानी चाचणी दि. ३१/०३/२०१८ व १/०४/२०१८ रोजी घेण्यात येणार आहे. Satara Police recruitment 2018 Physical test marks - Chest number 1731 to 2444. Satara Police recruitment 2018 Physical test marks - Chest number 1001 to 1727. D On 18/03/2018, the field trial will be held on 18/03/2018. It will be held on 31/03/2018 and on 01/04/2018. Physical tests for Maharashtra Contable will starts from 09-03-2018. For each district physical test will be conducted separately. Admit Card/Hall ticket for Maha Police Constable Physical tests is available in official website of www.mahapolice.maharecruitment.gov.in. Candidates have to login to this website using their Login Id and password which used at the time of online application form submission. Login with those details and download hall ticket and admit card.